3. Watch how easy it is! Send your analysis report to reputable music reviewers. Give them inspiration and validated market facts, based on a representative listening panel. Create a strong community around your music. Circulate ratings and reviews in your network. Benchmark for new music tests. Measure yourself with established artists. Where does your number rank? in a detailed report with graphics. to recognize and contact you. your music started easy and fast. to your music and your results. It takes less than 5 minutes to create yout very own, private analysis workshop - completely free. You can easily and quickly upload your music and start testing. an impartial abd representative audience. The listeners' evaluations are gathered in an analysis report that makes tells you everything about your market. The professional analysis is based on a representative, impartial listening panel. The analysis documents the market for your music and draws a profile of your music’s ideal audience. You get the listeners’ evaluation and constructive feedback. And then you will be able to access the professional music list. The price is 235$ (293.75$ VAT included) for 50 interviews regardless of whether the analysis is conducted in Denmark, Spain, USA – or a whole fourth country. All in just 3 days. Here you can involve your own audience and get feedback on your music. It is up to you to share questionnaires with your music in your own network. This is done easily, either directly from the analysis program, or by using a unique link (generated by the application) that you post, either on social media, text or email. Your music will be easy to find on the interactive music list. And it’ll be easer that ever to create a community on the social media. You get the facts about how big the market is for your music. And you can compare your music with other artists. of your music's ideal audience. For example, age, gender, behaviour, geography - even internationally. You decide who can see the result. Either everybody, or only the certain people you choose. The music list is ranked based on an impartial representative listening panel. Click on a number and listen it through. Or read the listeners’ reviews in the online report. Or share the number, and the analytical result, to a particular person or social media. Filter music list by music genre, mood or application guide. See what music (listeners think) best fits for example radio play or concert. Or, for example, music (listeners think) is played by the best band, has the best singer or the best lyrics. There is free media access to view the music list with its own unique pre-set. This allows the individual media to view the music list with relevant content that fits the media’s target audience. The same value is achieved for radio stations, venues and festivals, to match music that suits its audience. The version of the music list displayed on CEM MusicTest is the version that is exposed on Voxmeter’s opinion page under the music section, which is visited by thousands of people each day. Voxmeter continuously selects new music releases, that we run through the analysis program. The selected market analyses are used as background data for verifying the results and for use by artists using the analysis program to measure against. Voxmeter continuously works to show the value of using market analysis in connection with music. We do this by selecting 3-4 music tracks per week, where an analyst from Voxmeter prepares an analysis report published on www.cemmusictest.com and on Voxmeter’s opinion page www.voxmeter.dk. Drakes nye nummer er alt for kedeligt! https://cemmusictest.com/wp-content/uploads/2018/09/NewLogo-alene.png 0 0 Anders Munksgaard Andreasen https://cemmusictest.com/wp-content/uploads/2018/09/NewLogo-alene.png Anders Munksgaard Andreasen2018-05-11 11:46:492018-06-12 11:25:26Drakes nye nummer er alt for kedeligt! If you work in the music industry, you can have your own personal login that gives full access to all music analyses. The media have free access to both analytical reports, music lists and music analyses. This allows music critics to enrich their articles with ratings from a representative sample of listeners. Radio stations can freely refer to the analysis results and use the interactive music list. Through the analytics reports venues and festivals can match their audience with the ideal music and use the segmentation for targeted marketing. Music companies and music agents can do the same. The goal of Voxmeter’s weekly music analyses is to inspire the music industry’s actors on how market insights are applied in practice. And how we all, to a greater extent, can get each of our special music needs fulfilled.  CEM MusicTest is based on Voxmeter’s analysis model, CEM Intelligence, which is about contributing knowledge that makes it easier to develop good music experiences. The analysis model is based on the philosophy of Customer Experience Management – (CEM) MusicTest. Since 2008, the analysis concept has contributed to increased earnings among several companies in many other industries. Now the trip has come to the music industry. Below is a brief description of the analysis concept. A) How many people think your music is amazing. C) How many are out of reach. The next elements the market analysis reveals are the reasons of those who like your music. But not least, the reasons of those who think your music is okay. And maybe less interesting, the reasons among those who do not like your music, categorized as “out of reach”. Valuable feedback that is worth gold when developing your music. The last element in a market analysis is to draw a profile of each of the three segments. That is, knowledge and insights you can use when targeting the right audience and communicating the right messages. The reason that market analysis hasn’t been used in connection with new music in the music industry is partly due to habit, but primarily because it has been very costly. But with CEM MusicTest it has become much cheaper, easier and faster. New artists: So far, it has been difficult for new artists, especially within music, to get going towards the spotlight. New artists typically book their own gigs. Most often at small venues for a small hire. In addition to making art, they have to stand for their own marketing and promotion. Create their networks and seek contact with the right, and most often heavily sought after, decision makers. With CEM MusicTest, the showcase is now fully open to the benefit of the upcoming music scene and thus all of us who love music, and not necessarily just mainstream music. Established artists: With CEM MusicTest, it becomes far safer for established artists, who so far have had to wait in suspense to see if their new release lives up to their previous popularity level. Now a market analysis has become so cheap and can be done so quickly that one can improve a production before the final release. It will also be easy to expand its market because it can, much more precisely, frame and communicate the right thing to an artist’s ideal target audience. International artists: With CEM MusicTest, artists with international ambitions can achieve exactly the result through the same insights and the same showcase. The price of a market analysis is exactly the same, whether it is to be carried out Germany, the United States, England – or a whole fourth country – and it will be carried out at the same time – only 3 days! In October 2017, the overall monitoring “CEM Music Intelligence” began collecting thousands of interviews each month about citizens’ music consumption, music behaviour, preferences and demand. The monitoring also includes knowledge of and visits to venues and festivals, prioritization and evaluation of prices, music and physical frames, as well as plans for re-visits. In June 2018, Voxmeter launched the corresponding analysis section, CEM MusicTest, which maps and segments the market for music. Total online database: All data is available in an online database where the music industry’s actors can easily access analyses. Too many people, music is not a product but art. And the music industry uses far less market analysis compared to other industries. The music is increasingly fighting with other forms of entertainment, where the diversity of options on, for example, the Internet, with computer games, movie streaming, is getting wider. If the companies that the analysis industry so far has helped, chose to drop market analyses and instead followed the same marketing mechanisms as the music industry, we would all primarily eat Kohberg with K salad – washed down with Coca Cola. In other words, we would primarily know the big brands and the range of foods would be narrowed. The reason for a large diversity in the food rage is due, inter alia, to the fact that food companies analyse and involve the customers. Thus, the individual food business contribute to a greater variety, where each company identifies and cultivates each of its niche markets. With CEM Music Intelligence, the music industry can now achieve the same results. The listeners’ music consumption can triple if the diversity in the music supply becomes bigger. The same applies to the number of visits to venues and festivals. This is shown by Voxmeter’s weekly monitoring of citizens’ demand, consumption and behaviour in the music market. In the analysis industry, we are helping big and small businesses, in virtually all industries, to find and describe the ideal target groups of their products. This applies to both the largest product brands, but in the vast majority of cases we help the smallest and most unknown brands. The only industry we have not helped until now is the music industry. The foundation of a valid market analysis of music is based on a representative survey, where a random selection of potential customers (music consumers) determines whether they like the relevant track or not. It is absolutely crucial that all listeners are randomly selected, so that everyone in the target group has had the same chance of being heard. This means that you get the correct spread (representation) of person types and that the need for the number of interviews is minimized.